Dont miss out on your chance to save the galaxy with your FREE STEAM COPY OF MASS EFFECT. 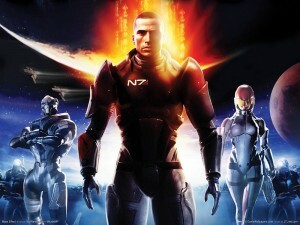 7 Comments on Dont miss out on your chance to save the galaxy with your FREE STEAM COPY OF MASS EFFECT. Do you feel down about the state of the galaxy? Do you wish you had the commanding authority of a super badass bent on eradicating evil while at the same time being dashingly awesome or terrifyingly douchy? Well wish no more!!! Now is your chance to win a FREE steam copy of MASS EFFECT. Its your turn to travel the galaxy kickin in doors and nut sacks, saving the day and getting the freakishly hot alien chick. Ill keep it simple. All you have to do is share your thoughts with TGB. You MUST post 1 comment under this article and then post 5 comments under any article (all 5 comments do not have to be under the same article) and let us know whats on your mind. Posting 1 comment here and then 5 comments anywhere else will enter you into this contest, and you must be a registered user to participate. The promotion will run for a week and end next Thursday 5/26/2011 at 12pm (noon). TGB staff are not eligible for the promotion. This is a Steam game and will require steam to download and play, if you dont have steam heres a link to get it, http://store.steampowered.com/about/, its free and quick and easy to set up. Whoever wins the game will either have to add me as a friend in steam or give me their email address so that I can deliver the game to you. If there are any questions feel free to post them here or contact me at pimpmasterf@thegamersblog.com. Free games! I hope this stuff keeps bringing traffic to the site. P.P.S. When I say “I never really got into”, I mean that I’ve never even played it. xD Sorry if that sounded like I played it once and thought it was clearance-bin-worthy. P.S. Thanks for the tip Coyote! As a heavy analyzer of good games and good plotlines, I can honestly say this is one of the best games I’ve ever played. As far as being a shooter it’s a cakewalk, but call it an RPG and it’s a damn instant classic. I would go ahead and toss up a review, but I’m going to wait and get a little closer to the drop of the third title. SEMI SPOILER ALERT BUT HONEST WARNING THAT YOU MAY WANT TO KNOW!- Tali, the quarian who joins you at some point in the game, is NOT SEXABLE in the first title. Do not waste your attempted flirting.